NOTE: This content is old - Published: Friday, Nov 24th, 2017. 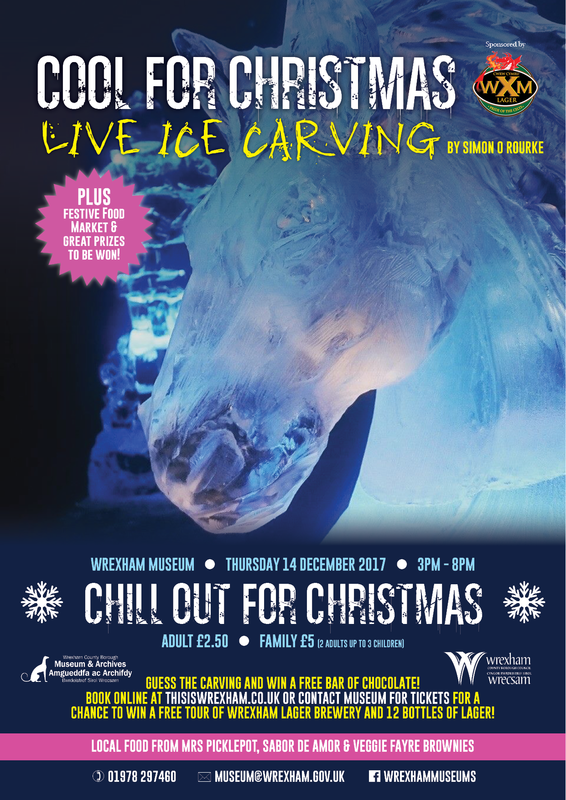 Chill Out for Christmas and come and see fantastic live ice carving at Wrexham Museum on Thursday 14th December from 3pm til 8pm!! Its going to be a really cool event and all sponsored by Wrexham Lager – WXM Lager with some great prizes to be won as well. Relax and enjoy your free complimentary drink in an ice glass, grab some festive grub from our café, do some Christmas shopping in our shop and if that’s not all – there’ll be free food tasting as well. You can try some delicious local food from Mrs Picklepot, Sabor de Amor, Veggie Fayre and Orchard Pigs. Then you will be ready to watch the sensational live ice carving on the museum forecourt by Simon O’Rourke – Tree Carving. See if you can guess what the carving will be and get free bar of delicious chocolate.